The site of the Al Aqsa mosque and its compound in Jerusalem, known as Temple Mount to Jews and Haram al Sharif to Muslims, is sacred to both religions. Ariel Sharon - then leader of the Israeli right-wing opposition - toured the site, surrounded by armed guards, provoking fury among Palestinians and others. After he left the site there were pitched battles between police and protesters. They sparked a wave of violence which many believe led to the second Palestinian intifada, or uprising. It never ceases to amaze me how the only person capable of getting Sharon back into leadership was Yasser Arafat. Sharon knew Arafat was looking for an excuse to try and get further concessions re: Taba and was only too happy to give it to him. A pretty poor excuse to start a second Intifada, particularly one that rapidly spiralled out of control of its author. I have been working in this region for years as an archaeologist, and Sharon's visit to the Temple Mount seemed to be the threshold event when everyone's temper boiled over. It was sad to see, really. In previous years, it was not uncommon to see an Israeli family walking though the bustling alleys of the Old City's Mulsim quarter. By 2002, many of the shops in the Muslim quarter were closed, some of my Arab friends were denied entry into Israel, and some of my Israeli friends were injured in the cafeteria bombing at the Hebrew University. Sharon's Temple Mount visit was certainly not a singular cause for the intifada, but it does seem to be the point when the scales were tipped. I had supported and sympathized with the Israeli's struggle my whole life until this unconscionable act made it clear that it was no longer a defensive posture. This one act was extremely offensive and totally unnecessary. What was so important that Sharon, the commander in charge of a brutal masscre of the Palestinian refugee camps in Lebanon nearly 20 years before, NEEDED to visit this holy spot right then? Would a few years wait have made a difference? Why hasn't he returned since? I've never heard a straightforward response to these questions from anyone. The aftermath was predictable. I feel that Israel no longer deserves my sympathy. I take issue with the reasoning that Ariel Sharon's visit to the Temple Mount sparked the intifada. Very few political analysts hold by this position anymore. The Palestinians used Sharon's visit as an excuse to attack innocent civilians. Such behavior is repulsive, and anyone who still holds to the belief that Sharon's visit sparked the intifada needs to re-learn their facts. At all our holy sites, starting with the Temple Mount, Muslims treat Jews the way that whites in South Africa or the southern US treated blacks. We are not allowed to enter except under the most stringent circumstances. So long as the BBC upholds such racist policies, it has no credibility. Arabs living in what used to be Palestine continue to find and seek their own defeat. Since when is a peaceful visit a reasonable cause for violence? 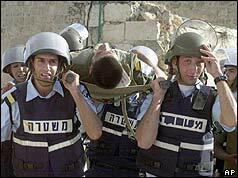 I remember it as if it were yesterday, and every day for the next couple of weeks from the start of that bloody day, Palestinians were dying at the rate of about 15-20 per day. Ariel Sharon, alone, bears the main brunt of responsibility. He is the one that wanted this endless cycle of violence and killing to go on. He brought down Barak so that he could break and disavow the hated Oslo accords. Ultimately, his goal is to never allow a Palestinian state to ever come into being, or if it does as a puppet state of Israel. We have seen escalation after escalation, culminating in the horror of the Jenin invasions of May 2002. It is funny that we can become so desensitised to the violence. Both sides have harmed each other immeasurably. The children and ordinary folks are the ones, of course, that suffer the most. Everything is so one-sided now, and tilted in Israel's favour, that there is no hope. Only a strong UN Multinational Peacekeeping force will stop it (killing & violence) now, and we can see that this will not happen, the USA is too busy with Iraq and Afghanistan - and Israel would object anyway. I would like to ask, what makes Israel so special, that she can ignore UN resolutions, the Geneva Conventions, and common decency? What we didn't know at the time, and only became clear later, was that the "Al Aqsa intifada" had been planned for some time, and only awaited a suitable pretext for launching. As Palestinian Minister of Communication, Imad Al-Faluji, told a crowd in the Ein Al-Hilweh reffugee camp in Lebanon, "Whoever thinks that the Intifada broke out because of the despised Sharon's visit to the Al-Aqsa Mosque, is wrong... This Intifada was planned in advance, ever since President Arafat's return from the Camp David negotiations, where he turned the table upside down on President Clinton."